Nilsen would sit with the bodies of his victims for days. 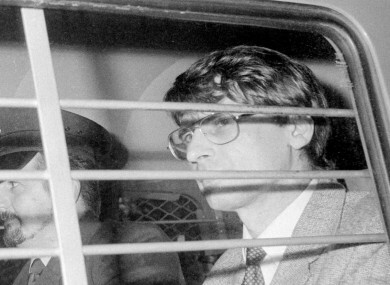 Dennis Nilsen after he was sentenced in 1983. DENNIS NILSEN, ONE of Britain’s most infamous serial killers, died in jail on Saturday aged 72, the Prison Service said. He died at Full Sutton maximum security prison in east Yorkshire, northern England. It is thought he died of natural causes. Nilsen is believed to have killed as many as 15 young men in a murder spree in the late 1970s and early 1980s. His victims were mostly homeless men killed at his home in north London. He would lure them to their death, strangling them and sometimes drowning them too. Nilsen would then typically bathe and dress the bodies and sit with them for days or weeks before dismembering them. He would also engage in sexual acts with the corpses. After removing their internal organs which would be dumped nearby, he would dispose of the remains either on a bonfire or by flushing smaller bits and bones down the toilet. He was caught by chance when a drain outside his home became blocked by the remains he tried to flush away. Nilsen was jailed for life in 1983 on six counts of murder and two of attempted murder. “As with all deaths in custody, there will be an independent investigation by the prisons and probation ombudsman,” a Prison Service spokesman said. Email “UK serial killer Dennis Nilsen dies in prison aged 72”. Feedback on “UK serial killer Dennis Nilsen dies in prison aged 72”.